With the turning of the year, soccer fans will be assaulted by a month of non-stop transfer rumors, culminating in the (in)famous Transfer Deadline Day, a favorite of Sky Sports and probably the third- or fourth-biggest event of the soccer season (for better or worse [definitely worse]). Arsène Wenger has recently stated his intent to strengthen the midfield this January - somewhat of a break from tradition - which is a clear need after virtually every senior midfielder has been injured at some point this season, but many fans will be clamoring for at least one player for defensive cover. With that in mind, here's a brief look at some of the players that have regularly been linked with a move to the Emirates. The French midfielder has been heavily linked with a move away from St Mary's, having been with the Saints since 2008. After the South Coast club sold a raft of first-team last summer, Schneiderlin publicly demanded a transfer, but seemingly backed down and helped guide his club to the top 4 of the Premier League before injury struck. A fee of around £25m may be required to convince Southampton to sell, and according to most recent rumors, a summer move is much more likely. Schneiderlin has featured highly on the transfer shortlists of many Arsenal fans, and the Gunner will likely face competition from Sp*rs for the Frenchman's signature. The Southampton man's experience in the Premier League would make him more of an appealing option than other linked players, and at the age of 25 should be approaching his playing peak soon. The young Portuguese midfielder has been highly touted since bursting on to the scene a few years ago. Seemingly every transfer window has plenty of rumors linking Carvalho with a move from Portugal, but so far nothing has transpired. He is another player whom a large number of Gooners would like to see in the red and white of Arsenal, and on paper looks like a perfect fit to sit in front of the back five. 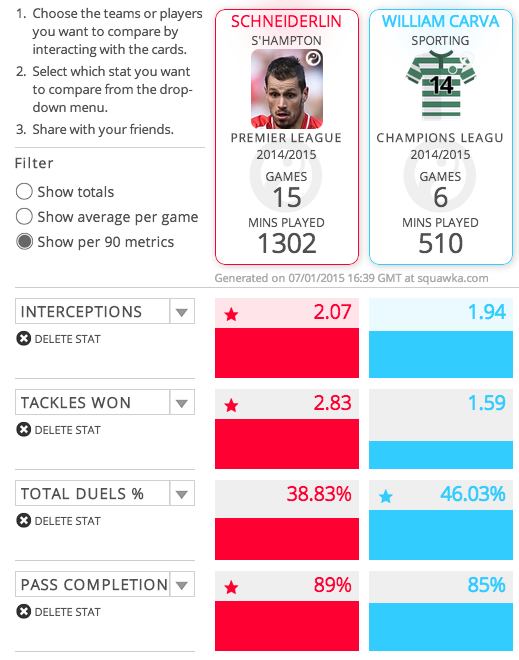 Carvalho and Schneiderlin have similar per-90 minute stats (as you can see in the image to the right), though Schneiderlin wins more tackles per 90, his success rate is slightly lower than Carvalho's. A fee of around £20m is being reported, and the Gunners would likely face competition from Manchester United and Chelsea. Rumors linking the French midfielder with a move to North London have increased over the last month or so. While he isn’t the defensive midfielder fans are screaming for, Sissoko can add a bit of bite in the middle of the park, but is probably better known for his attacking instincts - so don’t be surprised if the midfielder Arsène has been talking about turns out to be the Newcastle player. Sissoko has shown a keen eye for goal, and is taller than most of Arsenal’s current midfield (not sure if that helps). PSG are showing interest in Sissoko, and are hoping to seal a part-exchange deal with the Magpies by sending Yohan Cabaye back to St James’ Park. A fee of around £20-25m may be required for a straight-up deal to be completed. Reid has been heavily linked with a move away from the Boleyn Ground, with his manager Sam Allardyce conceding that the Kiwi defender has "no future" at the club. According to reports, when Reid first arrived at Upton Park, the locals weren't impressed, but over the last 4½ years he has become one of the Hammer's key players and has made 125 appearances for the East London club. Reid's contract expires this summer, so he is able to discuss terms with foreign clubs under the Bosman ruling, so should Wenger want to sign him now to avoid missing out, a fee of £3m is reported as the price of doing business in January. Reid would provide flexibility at the back and with his Premier League experience would be a perfect 3rd-choice center-half for a club of Arsenal's stature. 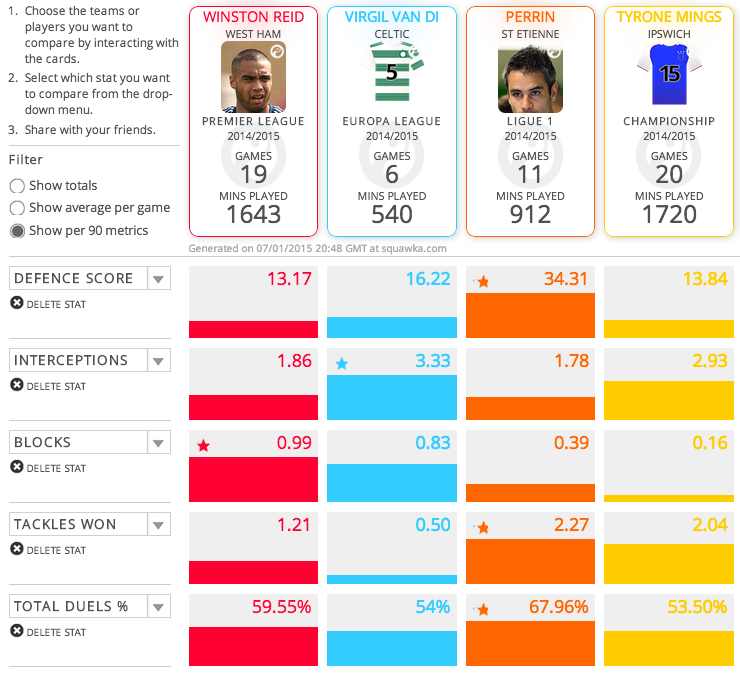 The Dutch defender seems to have outgrown the one-team league that is the SPL, and is often linked with a move south of the border. Van Dijk is yet to appear for his nation's senior side, but has youth on his side and a move to a Champions League club would certainly raise his profile. His per-90 stats are probably boosted by playing in a frankly terrible league, but he would seem to be of the quality to back up Mertesacker and Koscielny at Arsenal. However, the Gunners may have moved on from van Dijk, as most recent rumors are linking him with a move to Sunderland, and a mooted price of £8m for a mostly unproven player may be too high for Wenger's liking. Perrin has emerged in recent weeks as a potential Arsenal target, and on paper he'd be a good fit; he's an experienced central defender who can fill in at right-back and in defensive midfield if needed. He's also French. Arsenal have in the past had a strong academy link with Saint-Étienne and apparently Gilles Grimandi has been in France scouting the player, so there is a good chance he could move to the Emirates. Looking at the comparison matrix above, his defensive stats per 90 minutes are strong (though Ligue 1 isn't a particularly deep league), and at age 29 probably has 3 or 4 years of good performances left, and could probably be convinced to be a back-up if he gets the chance to play Champions League football. Reports suggest Arsenal have spoken to the player, but no deal has been struck with his hometown club. Mings signed for Ipswich in 2013 for £10,000 from Chippenham Town, and his meteoric rise looks set to continue with the youngster having been linked to several Premier League clubs. Wenger has always liked signing young players and improving them, though having signed Calum Chambers last summer, another young, flexible defender may be off the cards. However, he would join a growing core of young English players at the Emirates who would be able to grow together to form the spine of a future team. While most of his games have come at left back for the Tractor Boys, reports suggest Mings' future lies in the center of defense. Ipswich could ask for anything between £7-10m to let the player go, and with the club second in the Championship, they may ask for Mings to return on loan until the end of the season. Several media outlets are reporting that Calleri is very close to finalizing a move to North London. The young striker, who can also play on the wing, has been dubbed the "new Gonzalo Higuain" and has impressed enough for the Gunners to reportedly beat out Liverpool to Calleri's signing. With Lukas Podolski moving to Inter and Yaya Sanogo and Joel Campbell both heavily linked with loan moves, Calleri could go straight in to the first-team squad. According to reports, Arsenal have already had 2 bids - the most recent one valued at £1.7m - for the youngster rejected by Legia. As of writing, the Guardian are reporting that Arsenal are closing in on a deal, having been told by Legia that a fee of £2.5m will be required. Bielik would obviously be one for the future, and standing at 6'2" has been likened to Gunners legend Patrick Vieira. The player has stated his desire to move to Arsenal, and he spent time over the Christmas period at Arsenal's London Colney training ground. Rather than playing in the first team, like he has in Warsaw, Bielik would likely drop to the Gunners' academy and spend time on loan until he is ready to break in to the senior squad. Edinson Cavani - would be an upgrade up front, but squad needs and financial constraints make this very unlikely. Isco - several outlets are claiming Arsenal are lining up a £64m bid for the Real Madrid playmaker. Again, doesn't fit the positions of need, but this has never stopped Wenger before. Take this one with a pinch a salt. Petr Cech - Chelsea have just let Mark Schwarzer go, so don't expect Mourinho to let his only experienced back-up 'keeper move to a rival. Fabian Schar - has huge potential and would easily slot in to Koscielny's place in the team. His contract expires this summer. Mats Hummels & Ilkay Gundogan - the Dortmund duo would likely cost £50million as a package.